The peace of Frankfort had left Germany Prussianized and united, the most formidable of all the Great Powers of Europe. France was humiliated and crippled. Her lapse into republicanism seemed likely to leave her without friends in any European court. Italy was as yet a mere stripling. Austria sank now rapidly to the position of a confederate in German policy. Russia was vast, but undeveloped; and the British Empire was mighty only on the sea. Beyond Europe the one power to be reckoned with by Germany was the United States of America, growing now into a great industrial nation, but with no army nor navy worth considering by European standards. The new Germany, which was embodied in the empire that had been created at Versailles, was a complex and astonishing mixture of the fresh intellectual and material forces of the world, with the narrowest political traditions of the European system. She was vigorously educational; she was by far the most educational state in the world; she made the educational pace for all her neighbors and rivals. In this time of reckoning for Germany, it may help the British reader to a balanced attitude to recall the educational stimulation for which his country has to thank first the German Prince Consort and then German competition. That meant jealousy of the educated common man on the part of the British ruling class, which no patriotic pride or generous impulse had ever sufficed to overcome, went down before a growing fear of German efficiency. And Germany took up the organization of scientific research and of the application of scientific method to industrial and social development with such a faith and energy as no other community had ever shown before. Throughout all this period of the armed peace she was reaping and sowing afresh and reaping again the harvests, the unfailing harvests, of freely disseminated knowledge. She grew swiftly to become a great manufacturing and trading power; he steel output outran the British; in a hundred new fields of production and commerce, where intelligence and system was of more account than mere trader’s cunning, in the manufacture of optical glass, of dyes and of a multitude of chemical products and in endless novel processes, she led the world. To the British manufacturer who was accustomed to see inventions come into his works, he knew not whence nor why, begging to be adopted, this new German a method of keeping and paying scientific men seemed, abominably unfair. It was compelling fortune, he felt. It was packing the cards. It was encouraging a nasty class of Intellectuals to interfere in the affairs of sound businessmen. Science went abroad from its first home like an unloved child. The splendid chemical industry of Germany was built on the world of the Englishman Sir William Perkin, who could find no «practical» English businessman to back him. And Germany also led the way in many forms of social legislation. Germany realized that labour is a national asset that it deteriorates through unemployment, and that, for the common good, it has to be taken care of outside the works. The British employer was still under the delusion that labour had no business to exist outside the works, and that the worse such exterior existence was, the better somehow for him. Moreover, because of his general illiteracy, he was an intense individualist: his was the insensate rivalry of the vulgar mind; be bated his fellow manufacturers about as much as he bated his labour and his customers. German producers, on the other hand, were persuaded of the great advantages of combination and civility; their enterprises tended to flow together and assume more and more the character of national undertakings. This educating, scientific, and organizing Germany was the natural development of the liberal Germany of 1848; if had its roots far back in the recuperative effort that drew its impulse from the shame of the Napoleonic conquest. All that was good, all that was great in this modern Germany, she owed indeed to her schoolmasters. But this scientific organizing spirit was only one of the two factors that made up the new German Empire. The other factor was the Hohenzollern monarchy, which had survived Jena, which had tricked and bested the revolution of 1848, and which, under the guidance of Bismarck, had now clambered to the legal headship of all Germany outside Austria. Except the Tsardom, no other European state had so preserved the tradition of the Grand Monarchy of the eighteenth century as the Prussian. Through the tradition of Frederick the Great, Machiavelli now reigned in Germany. In the head of this fine new modern state, therefore, there sat no fine modern brain to guide it to world predominance in world service, but an old spider lusting for power. Prussianized Germany was at once the newest and the most antiquated thing in Western Europe. She was the best and the wickedest state of her time. The psychology of nations is still but a rudimentary science. Psychologists have scarcely begun to study the citizen side of the individual man. But it is of the utmost importance to our subject that the student of universal history should give some thought to the mental growth of the generations of Germans educated since the victories of 1871. They were naturally inflated by their sweeping unqualified successes in war, and by their rapid progress from comparative poverty to wealth. It would have been more than human in them if they had not given way to some excesses of patriotic vanity. But this reaction was deliberately seized upon and fostered and developed by a systematic exploitation and control of school and college, literature and press, in the interests of the Hohenzollern dynasty. A teacher, a professor, who did not teach and preach, in and out of season, the racial, moral, intellectual, and physical superiority of the Germans to all other peoples, their extraordinary devotion to war and their dynasty, and their inevitable destiny under that dynasty to lead the world, was a marked man, doomed to failure and obscurity. German historical teaching became an immense systematic falsification of the human past, with a view to the Hohenzollern future. All other nations were represented as incompetent and decadent; the Prussians were the leaders and regenerators of mankind. The young German read this in his schoolbooks heard it in church, found it in his literature, had it poured into him with passionate conviction by his professor. It was poured into him by all his professors lecturers in biology or mathematics would break off from their proper subject to indulge in long passages of patriotic rant. Only minds of extraordinary toughness and originality could resist such a torrent of suggestion. Insensibly there was built up in the German mind a conception of Germany and its emperor as of something splendid and predominant as nothing else had ever been before, a godlike nation in «shining armour» brandishing the «good German sword» in a world of inferior-and very badly disposed-peoples. We have told our story of Europe; the reader may judge whether the glitter of the German sword is exceptionally blinding. Germania was deliberately intoxicated; she was systematically kept drunk with this sort of patriotic rhetoric. It is the greatest of the Hohenzollern crimes that the Crown constantly and persistently tampered with education) and particularly with historical teaching. No other modern state has so sinned against education. The oligarchy of the crowned republic of Great Britain may have crippled and starved education, but the Hohenzollern monarchy corrupted and prostituted it. It cannot be too clearly stated, it is the most important fact in the history of the last half century, that the German people was methodically indoctrinated with the idea of a German world predominance based on might, and with, the theory that war was a necessary thing in life. The key to German historical teaching is to be found in Count Moltke’s dictum: «Perpetual peace is a, dream, and it is not even a beautiful dream. War is an element in the order of the world ordained by God».’ «Without war the world would stagnate and lose itself in materialism». And the anti- Christian German philosopher, Nietzsche, found himself quite at one with the pious field marshal. «It is mere illusion and pretty sentiment», he observes, «to expect much (even anything at all) from mankind if it forgets how to make war. As yet no means are known which call so much into action as a great war that rough energy born of the camp, that deep impersonality born of hatred, that conscience born of murder and cold-bloodedness, that fervor born of effort in the annihilation of the enemy, that proud indifference to loss, to one’s own existence, to that of one’s fellows, that earthquake-like soul-shaking which a people needs when it is losing its vitality». By one of those accidents in history that personify and precipitate catastrophes, the ruler of Germany, the emperor William II, embodied the new education of his people and the Hohenzollern tradition in the completest form. He came to the throne in 1888 at the age of twenty-nine; his father, Frederick III, had succeeded his grandfather, William I, in the March, to die in the June of that year. William II was the grandson of Queen Victoria on his mother’s side, but his temperament showed no traces of the liberal German tradition that distinguished the Saxe-Coburg-Gotha family. His bead was full of the frothy stuff of the new imperialism. He signalized his accession by an address to his army and navy; his address to his people followed three days later. A high note of contempt for democracy was sounded: «The soldier and the army, not parliamentary majorities, have welded together the German Empire. My trust is placed in the army». So the patient work of the German schoolmasters was disowned, and the Hohenzollern declared himself triumphant. The next exploit of the young monarch was to quarrel with the old chancellor, Bismarck, who had made the new German Empire, and to dismiss him (1890). There were no profound differences of opinion between them, but, as Bismarck said, the Emperor intended to be his own chancellor. These were the opening acts of an active and aggressive career. This William II meant to make a noise in the world, a louder noise than any other monarch had ever made. 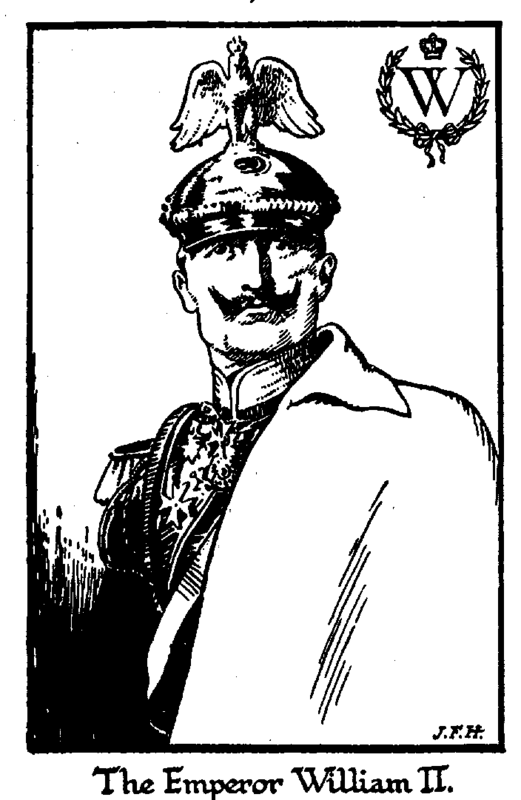 The whole of Europe was soon familiar with the figure of the new monarch, invariably in military uniform of the most glittering sort, staring valiantly, fiercely mustached, and with a withered left arm ingeniously minimized. He affected silver shining breastplates and long white cloaks. A great restlessness was manifest. It was clear he conceived himself destined for great things, but for a time it was not manifest what particular great things these were. There was no oracle at Delphi now to tell him that he was destined to destroy a great empire. The note of theatricality about him and the dismissal of Bismarck alarmed many of his subjects, but they were presently reassured by the idea that he was using his influence in the cause of peace and to consolidate Germany. He traveled much, to London, Vienna, Rome-where he had private conversations with the Pope-to Athens, where his sister married the king in 1889, and to Constantinople. He was the first Christian sovereign to be a Sultan’s guest. He also went to Palestine. A special gate was knocked through the ancient wall of Jerusalem so that he could ride into that place; it was beneath his dignity to walk in. He induced the Sultan to commence the reorganization of the Turkish Army upon German lines and under German officers. In 1895 he announced that Germany was a «world power», and that «the future of Germany lay upon the water»- regardless of the fact that the British considered that they were there already-and he began to interest himself more and more in the building up of a great navy. He also took German art and literature under his care; he used his influence to retain the distinctive and blinding German black letter against the Roman type used by the rest of western Europe, and he supported the Pan-German movement, which claimed the Dutch, the Scandinavians, the Flemish Belgians, and the German Swiss as members of a great German brotherhood as in fact good assimilable stuff for a hungry young empire which meant to grow. All other monarchs in Europe paled before him. He used the general hostility against Britain aroused throughout Europe by the war against the Boer Republics to press forward his schemes for a great navy, and this, together with the rapid and challenging extension of the German colonial empire in Africa and the Pacific Ocean, alarmed and irritated the British extremely. British liberal opinion in particular found itself under the exasperating necessity of supporting an ever-increasing British Navy. «I will not rest», he said, «Until I have brought my navy to the same height at which my army stands». The most peace loving of the islanders could not ignore, that threat. In 1890 he had acquired the small island of Heligoland from Britain. This he made into a great naval fortress. As his navy grew, his enterprise increased. He proclaimed the Germans «the salt of the earth». They must not «weary in the work of civilization; Germany, like the spirit of Imperial Rome, must expand and impose itself». This he said on Polish soil, in support of the steady efforts the Germans were making to suppress the Polish language and culture, and to Germanize their share of Poland. God he described as his «Divine Ally». In the old absolutisms the monarch was either God himself or the adopted agent of God; the Kaiser took God for his trusty henchman. «Our old God», he said affectionately. When the Germans seized Kiau-Chau, he spoke of the German «mailed fist». When he backed Austria against Russia, he talked of Germany in her «shining armour». The disasters of Russia in Manchuria in 1905 released the spirit of German imperialism to bolder aggressions. The fear of a joint attack from France and Russia seemed lifting. The emperor made a kind of regal progress through the Holy Land, landed at Tangier to assure the Sultan of Morocco of his support against the French, and- inflicted upon France the crowning indignity of compelling her by a threat of war to dismiss Delcasse, her foreign minister. He drew tighter the links between Austria and Germany, and in 1908, Austria, with his support, defied the rest of Europe by, annexing from the Turk the Yugo-Slav provinces of Bosnia and Herzegovina. So by his naval challenge to Britain and these aggressions upon France and the Slavs he forced Britain, France, and Russia into a defensive understanding against him. The Bosnian annexation had the further effect of estranging Italy, which had hitherto been his ally. Such was the personality that the evil fate of Germany set over her to stimulate, organize, and render intolerable to the rest of the world the natural pride and self-assertion of a, great people who had at last, after long centuries of division and weakness, escaped from a jungle of princes to unity and the world’s respect. It was natural that the commercial and industrial leaders of this new Germany who were now getting rich, the financiers intent upon overseas exploits the officials and the vulgar, should find this leader very much to their taste. Many German’s who thought him rash or tawdry in their secret hearts, supported him publicly because he had so taking an air of success. Hoch der Kaiser! Yet Germany did not yield itself without a struggle to the strong-flowing tide of imperialism. Important elements in German life struggled against this swaggering new autocracy. The old German nations, and particularly the Bavarians, refused to be swallowed up in Prussianism. And with the spread of: education and the rapid industrialization of Germany, organized labour developed its ideas, and a steady antagonism to the military and patriotic clattering of its ruler. A new political party was growing up in the state, the Social Democrats, professing the doctrines of Marx. In the teeth of the utmost opposition from the official and clerical organizations, and of violently repressive laws against its propaganda and against combinations, this party grew. The Kaiser denounced it again and again; its leaders were sent to prison or driven abroad. Still it grew. When he came to the throne it polled not half a million votes; in 1907 it polled over three million. He attempted to concede many things, old age and sickness insurance, for example, as a condescending gift, things which it claimed for the workers as their right. His conversion to socialism was noted, but it gained no converts to imperialism. His naval ambitions were ably and bitterly denounced, the colonial adventures of the new German capitalists were incessantly attacked by this party of the common sense of the common man. But to the army, the Social Democrats accorded a moderate support, because, much as they detested their homegrown autocrat, they hated and dreaded the barbaric and retrogressive autocracy of Russia on their eastern frontier more. The danger plainly before Germany was that this swaggering imperialism would compel Britain, Russia, and France into a combined attack upon her, an offensive-defensive. The Kaiser wavered between a stiff attitude towards Britain and clumsy attempts to propitiate her, while his fleet grew and while he prepared for a preliminary struggle with Russia and France. When in 1913 the British government proposed a cessation on either hand of naval construction for a year, it was refused. The Kaiser was afflicted with a son and heir more Hohenzollern, more imperialistic, more Pan-Germanic than his father. He had been nurtured upon imperialist propaganda. His toys had been soldiers and guns. He snatched at a premature popularity by outdoing his father’s patriotic and aggressive attitudes. His father, it was felt, was growing middle-aged and over-careful. The Crown Prince renewed him. Germany had never been so strong, never so ready for a new great adventure and another harvest of victories. The Russians, he was instructed, were decayed, the French degenerate, the British on the verge of civil war. This young Crown Prince was but a sample of the abounding upper-class youth of Germany in the spring of 1914. They had all drunken from the same cup. Their, professors and teachers, their speakers and leaders, their mothers and sweethearts, had been preparing them for the great occasion that was now very nearly at, hand. They were full of the tremulous sense of imminent conflict; of a trumpet call to stupendous achievements, of victory over mankind abroad, triumph over the recalcitrant workers at home. The country was taut and excited like an athletic competitor at the end of his training.